I'm not sure how this one flew under my radar, but the popular Twitter app Twidroyd is no more. Seems the good folks at UberSocial have combined forces with the Twidroyd team for their own release of UberSocial in the Android Market. 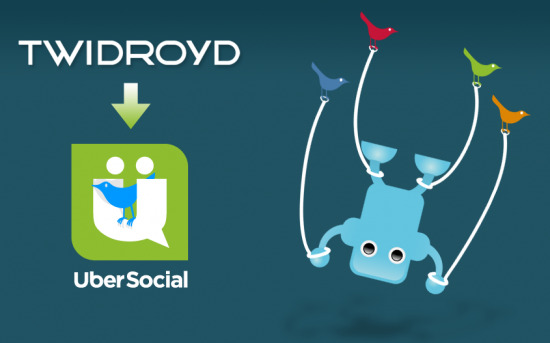 Rather than spending precious time and manpower on building their own Twitter app from scratch, Twidroyd will essentially be rebranded as UberSocial with a few tweaks and enhancements. UberSocial has long been known as one of the best Twitter clients for iPhone and Blackberry with premium features and functionality. Combine that with arguably one of the best Twitter apps for Android and viola: instant magic. If you are a former Twidroyd Pro User: please leave Twidroyd Pro on your phone so that when we make changes to UberSocial for Android in the next few weeks, your phone’s device # will automatically trigger the premium version of UberSocial for Android. Currently, there is no difference between regular and premium versions of UberSocial for Android.